After our adventures in Olympia with Brian we went on down to Portland for the weekend. There was a special birthday for a family friend of Brian's that lives in China. I had never met her so that was fun! (sorry, no pictures, what was I thinking???) We also got to stay with Aunt Priscilla, Uncle Dan, and their two puppies. 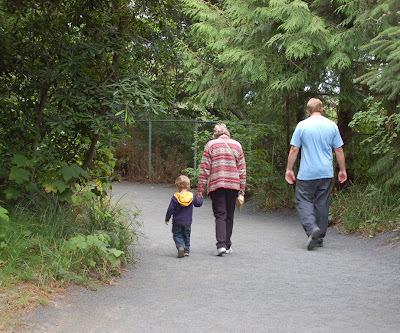 We dropped Brian off for his last week in Olympia and Cory and I came home. I was so tired and I was amazed that my little man stayed awake the whole car ride home until 11pm and kept me up! It was kind of fun actually and I was so glad he had! First stop, Jason and Amber's house! Cora is one year and one day younger than Cory. 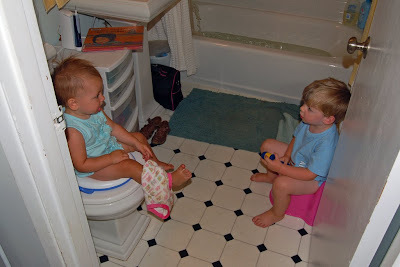 She's working on potty training so we thought Cory might be interested. (As of this writing we're still working on it...) It was pretty funny to watch though! 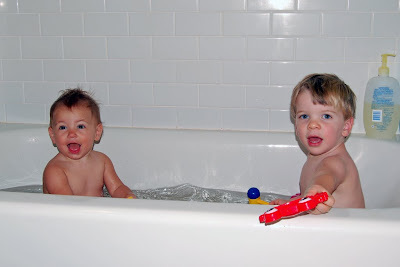 Rub a dub dub, two kids in the tub! Then it was off to Newberg for church (where we went in college) and lunch with our lovely friends, the Cadds, who live in Kenya! Lucky for us we got to see them since they were leaving the next day to go home! Once again, silly me, no pictures. And finally Sunday afternoon we arrived in Newport for a week's vacation with the grandparents. Unfortunately I apparently hadn't read the house description quite well enough and we were short one queen size bed... so Brian and I played Leave it to Beaver all week on twin beds. He even got one that was listing! Appropriate since the house was entirely nautical themed. The weather was typical coast weather, but we did get at least one day of sun and a few more with no rain! 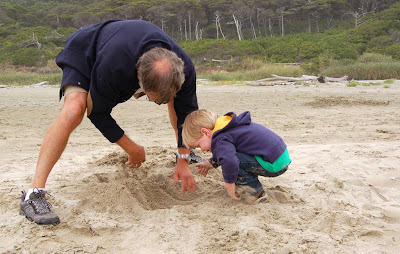 Grandpa showing Cory how to dig... or is it the other way around? We could see the beach from the house, but it was up on a cliff so quite a hike to actually get down to the beach. Once again, poor reading of the house description on my part. But did I mention that this was the house Brian's family spent their summer vacations in when he was growing up? Yeah, that was the main reason for staying there. It was also quite cheap and, I must admit, had quite a bit of character! 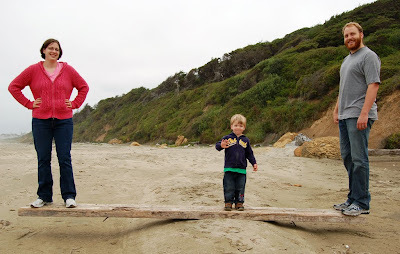 We found this old board on the beach and used it as a teeter totter. Cory wasn't quite sure what to think of it, but we had fun! 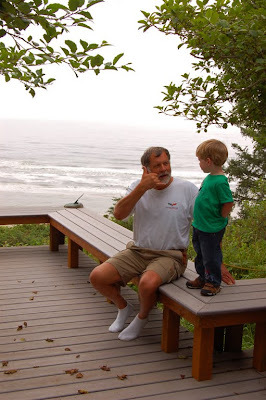 Cory and Grandpa... I think they were talking to Mr. Yellow Slicker (who you can see in the picture below). Also, notice the beach is quite a ways below! 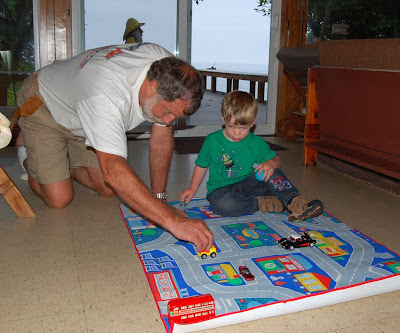 Grandpa and Cory playing cars on the road that Grandma made for Brian when he was a boy! Grandpa brought his Corvette car to play with and during the week bought Cory a Lightning McQueen die car. It is one of his most prized possessions! Of course no trip to Newport is complete without a visit to the aquarium! Cory thought it was pretty cool, but after about 10 seconds in front of each tank he would say "I want to see something else" so we saw the whole thing in record time! I particularly like their seals, sea lions, and sea otters and they were all swimming around for us to see! 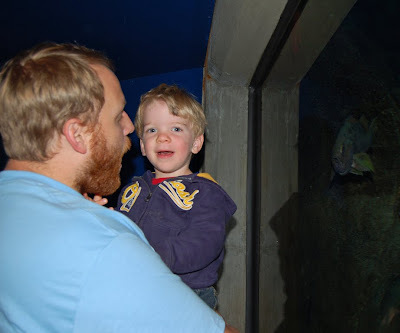 Cory wasn't so sure about the touch tank (with manta rays! ), but maybe next time! Cora and Cory are so cute!!! Book: eye of the god *and giveaway!